Recently I entered a contest, deciding to procrastinate no longer in learning to create animated GIFs in Photoshop to announce my latest product. The process was much easier than I had imagined. 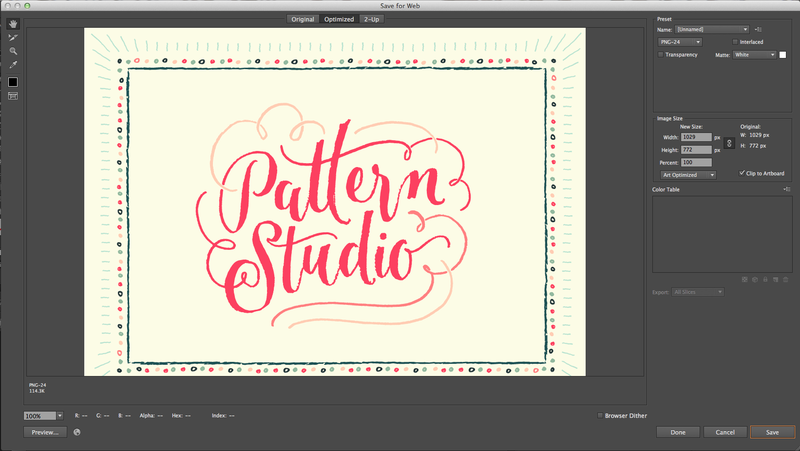 Drawing inspiration from the header here, I created a fun and easy way to animate my hand lettering- or any design- using Photoshop to create an animated GIF. I’ve also created some actions (which you can download free) that streamlined and sped up the process. First, I created 3 different versions of the same lettering piece. First, I sketched out the original with my trusty Graphic 1 pen, then traced it twice with tracing paper. I didn’t mind if the results weren’t perfect, because I was going for a rustic, homey look. I also added some fun bursts to two of the variations just for kicks. 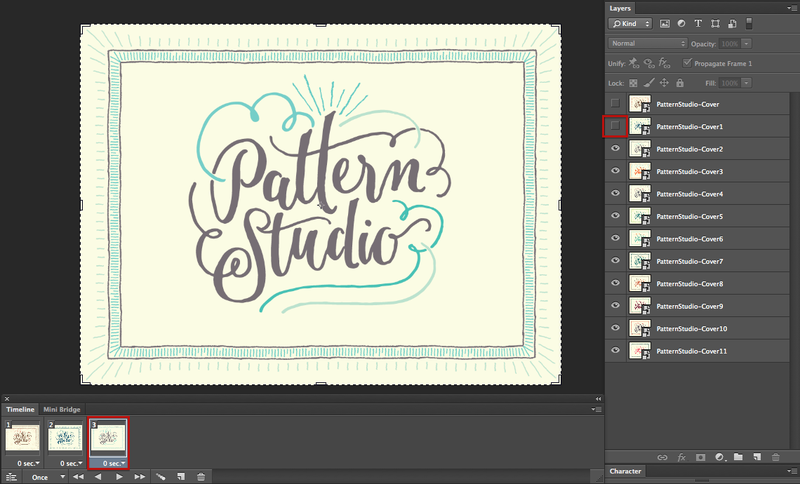 Once I had brought each lettering piece into Photoshop and cropped or erased any unnecessary parts of each image, I used my handy LetterPrep – Step 1 PS action to isolate the lettering. 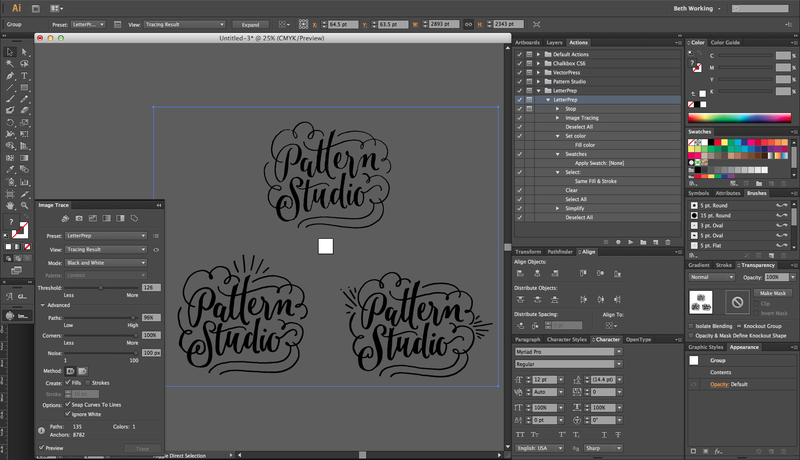 At that point, I used a second PS action LetterPrep – Step 2 to get the lettering ready for Illustrator. Next, I selected all (CTRL / CMD + A), copied the flattened file (CTRL / CMD + C), then pasted it into a new Illustrator document (CTRL / CMD + V). In Illustrator, I then live-traced the lettering, using these settings (I use a variation of these settings to trace all of my lettering) and then used the LetterPrep action to do a rough preparatory clean-up of the letter paths. Click on the image to view the settings larger. 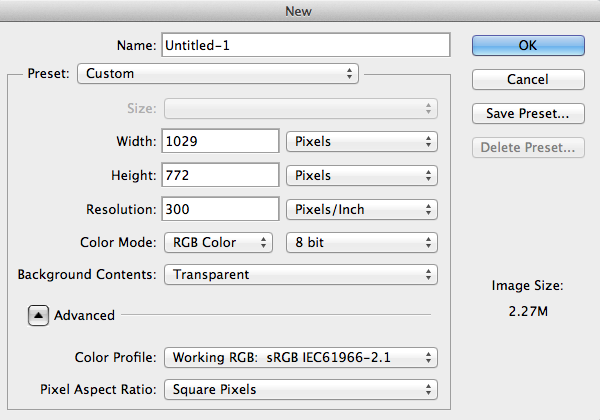 After that, File > Place all tiles into your document in the order you want them to appear as slides in your GIF. Next, in your Photoshop timeline (Window > Timeline) click “Create Frame Animation“. Create a new slide for each layer in your layers panel by clicking the paper icon (“Duplicate Slide” – boxed in red) on the bottom of the Timeline panel. To customize the next slide, hide the first layer, so that the second tile is shown. Repeat this process for all tiles. Each tile should have a different layer shown, with the layers above hidden. When you’re done, and each slide shows a different tile, adjust the time on each slide. This defines the slide’s duration. I’ve set each of my slides for 0.5 seconds. When you’re done setting the time limit for each slide, set the loop options. I’ve chosen “Forever.” At that point, you can click the “Play” button (a tiny > arrow) to test out your animation. Finally, select the first slide, then save your file for web as a GIF. Go to File > Save for Web… and save it as a GIF. Make sure “Forever” is selected under Looping Options to make your GIF loop perpetually. Click to view the settings larger. Enjoy your GIF! 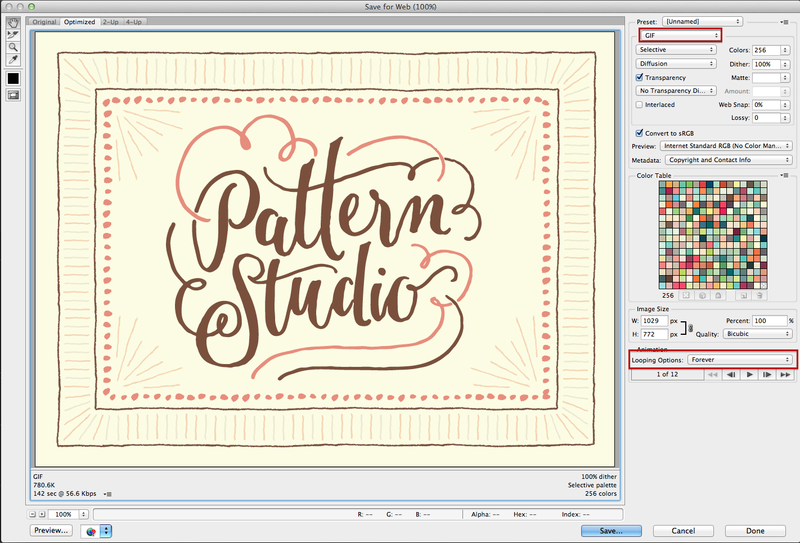 There’s a fun and easy way to animate your handlettering! Download my LetterPrep Action Pack if you haven’t already. 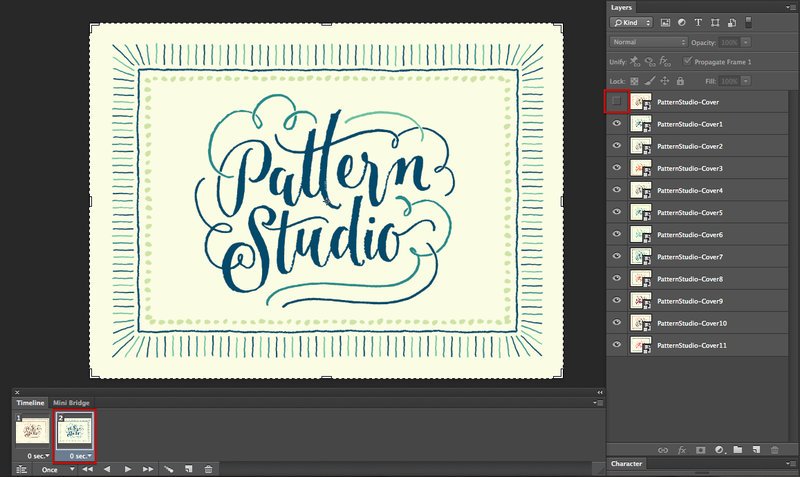 It’s also super useful for general lettering projects, placing your lettering over a photo, or doing basic vectorizing or design prep. And pssssst… If you liked the handmade borders showcased in this tutorial, check this out. Please contact me if you have any questions, and have fun! For day 23 of #30DaysofBibleLettering, I had the honor to team up with the talented @Godsfingerprints to create this piece (painting by Laura, lettering by me:) “Cast your burden on the Lord, and he will sustain you; he will never permit the righteous to be moved.” #Psalms‬ ‭55:22‬ ‭#ESV Go check out @godsfingerprints’s account for more scripture art and uplifting paintings!